When I was a youngster I used to bring my Amiga over to my Grandma's house and spent most of the time playing in a slightly darkened room with games that I'd recently purchased at the local market. This new game by GrimTalin, which is called 'The Adventures of Elena Temple ', hopes to give you that experience once more. As from your perspective you'll be playing games on make believe systems that look very much like the systems of old. 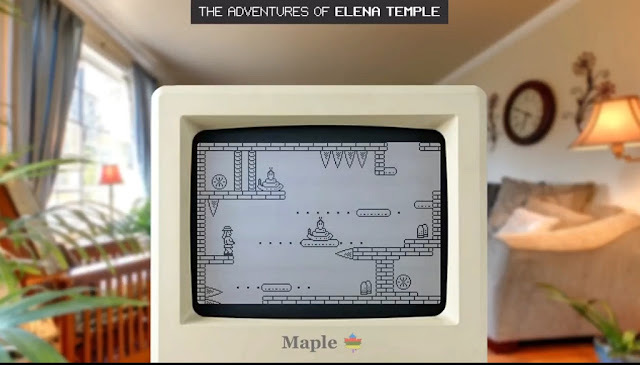 Now usually games like this are developed using a multitude of graphical styles depicting a game of the era, but The Adventures of Elena Temple goes all out. It doesn't just have the look of a Macintosh (Maple?) or other retro system, but the game is played in such a view point it takes you back to being a kid again even with an old Game Boy Advance style design right in front of you. Sadly however the game isn't complete and is still in early access, but the developer has noted the full game will have a dungeon of 50+ screens, open exploration, challenging platforming levels and much much more!